I have been reading through Jalbrecht42's Build thread over on Pirate 4x4. It is dated 2008, so no spring chicken article. I have not read through all his pages, but I got many a good chuckle with his humorous Captions of his efforts. (like you and I - do the job 4-times to get it right). we hope. What stopped me was this brake bleeding TIP which I would never have thought of for doing a "power-bleeding" procedure. He shows how he drilled the brake bleeder so it would seat properly and not leak brake fluid out around the threads. 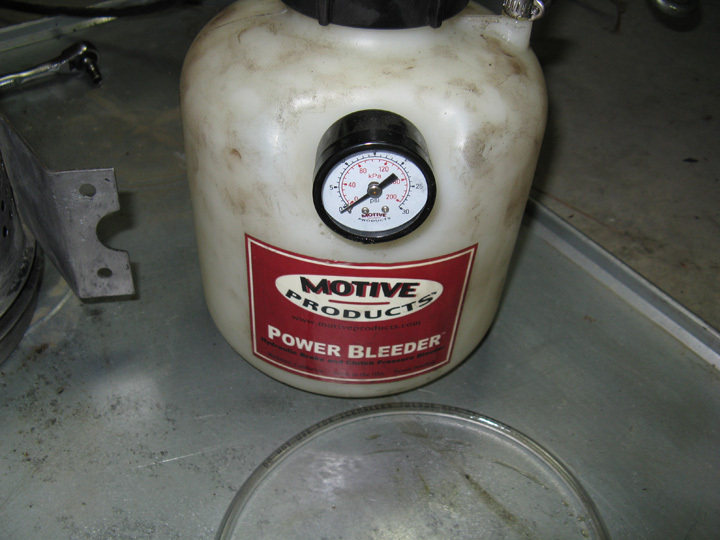 Personally, I have always cracked each bleeder and let it run down the backing plates and drip onto the tire sidewalls and onto the shop floor, making a terrible mess. throwing out news-papers helps, but just like halbrecht42 mentioned earlier: when he blew a light "hsss" of air through the front brake hose, he didn't realize the other end was directed at his pants pocket, and got soaked. Just my luck tipping over the container with the lid off. This "home-made" bleeder tip is a nice trick to remember if someone is hoping to a home-power-bleed without making a Big-Mess. And after all the effort of rebuilding his T-90 transmission, it still jumped out of second-gear on Deccel. Damn the luck. So, to fix that he purchased a T-98 Granny 4-speed with 6:1 crawler-gear. For the T-98 refurb, see page 13. And earlier in the Thread, he showcases his disc-brake conversion. This article in general is a great reference. He put a Clifford Cam in the L134 engine. I don't know that he ever installed a TBI fuel injection. Back when I first purchased it, they had the old-fashioned m/c pads that needed to be secured by chains and "J" hooks. For a while now, they have custom threaded caps that make sealing to the reservoir much easier and more effective. They even have a threaded aluminum cap that fits our m/c - although it does need a gasket added. Once this is attached and pressurized, I can go to each wheel and open/close the valves (I also attach a small length of hose to the end to direct the flow. WE always pushed a piece of rubber/neoprene hose over the bleader then ran it into a pop bottle half full of brake fluid. If I remember correctly we used 8oz Coke bottles cause they had a shape that would allow use to twist a coat hanger around them to use as a hanger. (this was doing the job up on the hoist). WE would have never let the fluid run down the backing plate. be to hard to detect a leak with it already wet. Russ, I will probably go through life with never having used a power bleeder. I know, when i crack the bleeder open not all the fluid goes through the hose. I seems some works its way out around the threads, and dribbling down onto the backing plates. Most of the fluid running down my arm into my t-shirt while I am laying on my back not able to move because my t-shirt is hung-up on the exhaust pipe hanger ! _ _ always a mess even with a hose. And of course, the wrench slips and knocks the hose off the bleeder. Yikes ! At least the brake fluid washes off with water. My wife shrieks when I invite her to press the pedal for bleeding time. hahahahaha, i'd be down the rabbit hole without her. At least the spilled fluid will clean the old paint off the backing-plates getting them prepped for a new coat of Krylon spray-paint. Silver-lining kinda guy, are ya?